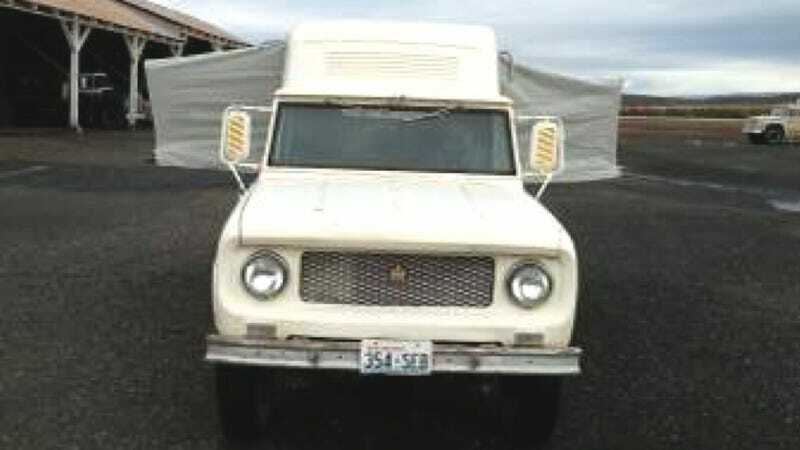 Sweet Baby Jesus Is Anything Cuter Than An International Scout Camper? Looks like there was a factory or extremely clean aftermarket camper conversion for the first-generation International Scout, and I think it's just dethroned the Toyota Chinook as the most adorable microcamper sold in America. This one here is for sale somewhere in Washington State (so many of them are!) at an ambitious ask of $15,000. The sad thing is I'm actually tempted... too bad the ad pictures were taken with a mid-90's Polaroid. The '63 Scout (model "80") would have been the first generation... easiest visual giveaway is the windshield wipers on the top of the glass and an extremely sparse dashboard. The stock engine was a 152 slant-four cylinder with a three-speed manual. I love all Scouts but these early ones ('61 to '65) have always been my favorites, though basically just because I love fold-down windshields. Sure, I've dreamed of moving in with my special lady someday... but I think we can all agree that's worth postponing for a few years of vagrant bliss living inside a truck this perfect. All I'd need is a 4G WiFi rig and this could be the new Truck Yeah HQ! Whoever buys this... please call me, I want to hang out. Images via Craigslist. Hat tip to to the IH Scout and Light Truck Nationals Facebook group for showing/tantalizing me with this.